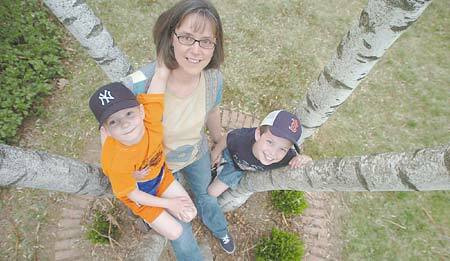 Ruth Estabrook says the reaction among friends and acquaintances is nearly a 50-50 split when she tells them she and her young sons Simon, 8, and Luke, 6, will soon be leaving Exeter for a probable five-year stay in Africa. "Half the people are (saying), ‘What, are you crazy?’ and the other half are more (like), ‘Great,’ and ask a lot of questions," Estabrook says. Estabrook has already made two trips to Africa as a Peace Corps volunteer. A native of North Reading, Mass., Estabrook made her first trip from 1988 to 1990, when she was a recent graduate of the University of Maine. She taught high school math in Niger. After she received her graduate degree (as a Peace Corps Fellow) from Columbia University and met and married Jeff, they worked together in the African country of Gabon from 1994 to 1996. The couple settled in Exeter shortly after their return. Jeff, who grew up in Massachusetts and Maine, worked in an administrative position for a local heating and air-conditioning company. Ruth taught math in the Exeter Adult Education program. Suffice to say, their wanderlust and passion for service never left. Especially for Ruth, it seems inbred: An uncle was a Peace Corps volunteer; her parents, Reginald and Suzanne Gagnon, recently did a five-month volunteer stint in Haiti. "We’ve lived in Exeter for nine years. It’s been a long time to be in one place," Ruth says, with a warm smile framed by her straight, no-frills light brown hair. "Anytime I come back from one place, I’m always thinking, ‘Where can I go next?’"
This time the destination is the landlocked West African country of Burkina Faso. That’s where Jeff is now. He is the country’s Peace Corps administrative officer, a paid position. Until early April, the family thought the destination would again be Gabon, where Jeff was first assigned in February. Instead, he was shifted from the 25-volunteer country on the coast to Burkina Faso, where roughly 100 volunteers are operating. "He was sent where he was needed most," Ruth says. For Ruth, there is no doubt about the trip. She needs to be with her husband; the boys need to be with their father. But it’s more than a desire to keep the family unit whole. It’s also a conscious decision to expose her children to the wider world, a decision she and Jeff they began planning even before they had children. "We talked about it when we left Gabon," Ruth says. "We saw lots of families with kids and how their children’s minds were just opened up to the whole wide world." Instead of hesitating to go back to Africa because of the boys, "they’re actually one of the biggest reasons for us to do it," Ruth added. As she says this, Simon is expressing his dislike of bugs and Luke is extolling the length of the skid mark he made in the gravel driveway. One wonders how two kids raised in the relative affluence of Exeter will adapt to an impoverished country, a foreign language (French is the official language) and the instant realization they are now a member of the distinct minority. "I think it’s going to be cool," says Simon, a second-grader. He does make it clear he’ll be bringing his Game Boy and gets a worried look when his mother teases that once the batteries wear out, there won’t be replacements. Luke says he looks forward to seeing a camel, adding in a matter-of-fact way, "I think the people are going to be black." "Early elementary seemed the best time to do it," Ruth says. "They’re not so old they’ll be mad about leaving behind their friends, and they’re still young enough to soak up a new language." The family won’t be living in traditional local housing of mud huts replete with lizards and occasional four-footed visitors (goats mostly). Ruth says she has been told there is a four-bedroom house with electricity and running water waiting for them. Chance are many of the people who responded to the Estabrooks’ relocation plans with "What? Are you crazy?" were silently thinking, "That sounds pretty dangerous." There are several regions of social unrest and even outright civil war on the African continent. Further, much of the region is Islamic and harbors strong anti-American sentiments. Peace Corps currently operate in 26 African countries. "Peace Corps only goes to places where it is invited to go, and the people always seem thrilled to have Peace Corps volunteers," Ruth says. "And they show respect for our efforts because, unlike other aid agencies, Peace Corps volunteers make a determined effort to become part of the community." 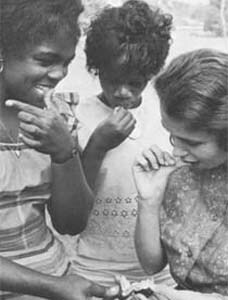 Peace Corps, started in 1961, emphasizes volunteer training in local languages and customs before volunteers begin the actual work-related jobs. Jeff is in a paid position, with a 30-month contract, which is renewable for another 30 months. While the option exists to return after the first stint is over, Ruth said she fully expects the family to be in Africa for five years. During that time, she does not plan to return to volunteer work. She’ll first focus on making sure the boys acclimate to the country, customs and diet, and adapt to an international school with a student body representing more than 20 nationalities. When she’s sure Simon and Luke "are happy and making friends," then she’ll consider applying for a teaching position at the international school. "I’d also be interested in teaching in one of the local schools," she says. Right now there is an anxious anticipation to the Estabrooks’ lives, a sort of "limbo" as Ruth puts it. They sold their home in Exeter on April 7 and expected to depart the next week. Then they got word that their travel plans would be delayed six weeks, primarily to accommodate Jeff’s switch from Gabon to Burkina Faso. Fortunately they were able to find a comfortable in-law apartment in East Kingston, but bikes and some of the 4,000 pounds of allowed personal belongings had already been shipped. "I was ready to go a week ago," Ruth says. "The kids just really miss their dad, and he really misses them."